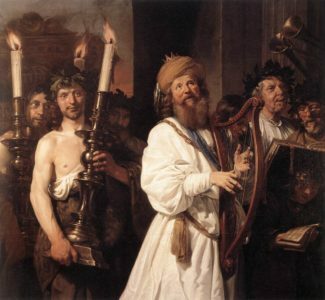 “David Playing the Harp” (1670) is a painting by Dutch artist Jan de Bray. The Greek poet Homer recounts how the heroic warrior Odysseus found refuge on the island of the nymph Calypso. The Trojan War is over: Amor, the god of love, now teasingly places the battle helmet on Calypso’s head. Odysseus and Calypso instantly fall in love. This painting hung in the Soestdijk hunting lodge, in the apartment of Mary Stuart, the consort of William III. 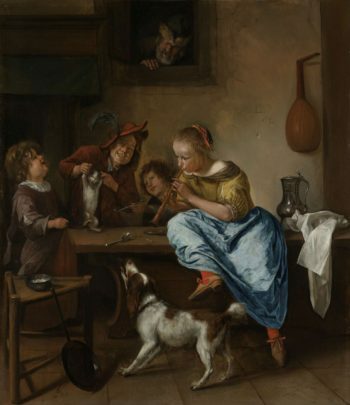 “Children Teaching a Cat to Dance” (c. 1665-1668) is a painting by Dutch artist Jan Steen. “Cupid Sleeping” (c. 1618) is a painting by Italian artist Caravaggio. “Domine, quo vadis? is a painting by the Italian Baroque painter Annibale Carracci, according to the apocrypha Acts of Peter. Dating from c. 1602, it is housed in the National Gallery, London. 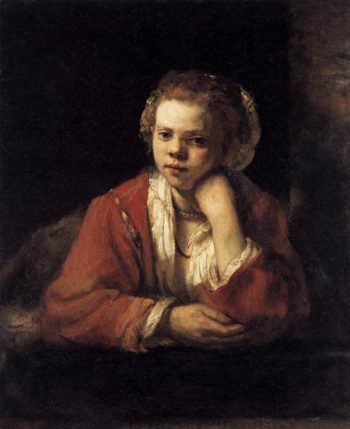 “Girl at a Window” (1651) is a painting by Dutch artist Rembrandt Harmenszoon van Rijn. 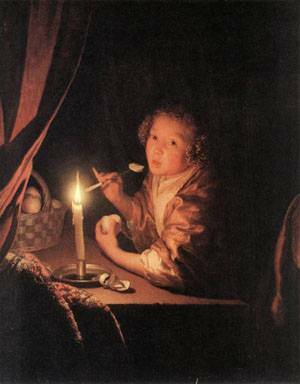 “Girl Eating an Apple” (c. 1675-1680) is a painting by Dutch Golden Age artist Godfried Schalcken.